(Medical Xpress)—When you walk into a darkened room, your first instinct is to feel around for a light switch. You slide your hand along the wall, feeling the transition from the doorframe to the painted drywall, and then up and down until you find the metal or plastic plate of the switch. During the process you use your sense of touch to develop an image in your mind of the wall's surface and make a better guess for where the switch is. Sliman Bensmaia, PhD, assistant professor of organismal biology and anatomy at the University of Chicago, studies the neural basis of tactile perception, or how our hands convey this information to the brain. In a new study published in the Journal of Neuroscience, he and his colleagues found that the timing and frequency of vibrations produced in the skin when you run your hands along a surface, like searching a wall for a light switch, plays an important role in how we use our sense of touch to gather information about the objects and surfaces around us. 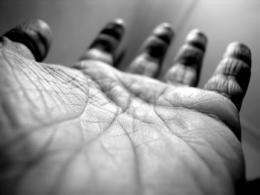 The sense of touch has traditionally been thought of in spatial terms, i.e. receptors in the skin are spread out across a grid of sorts, and when you touch something this grid of receptors transmits information about the surface to your brain. In their new study, Bensmaia, two former undergraduates, and a postdoctoral scholar in his lab—Matthew Best, Emily Mackevicius and Hannes Saal—found that the skin is also highly sensitive to vibrations, and that these vibrations produce corresponding oscillations in the afferents, or nerves, that carry information from the receptors to the brain. The precise timing and frequency of these neural responses convey specific messages about texture to the brain, much like the frequency of vibrations on the eardrum conveys information about sound. Neurons communicate through electrical bits, similar to the digital ones and zeros used by computers. But, Bensmaia said, "One of the big questions in neuroscience is whether it's just the number of bits that matters, or if the specific sequence of bits in time also plays a role. What we show in this paper is that the sequence of bits in time does matter, and in fact for some of the skin receptors, the timing matters with millisecond precision." Researchers have known for years that these afferents respond to skin vibrations, but they studied their responses using so-called sinusoidal waves, which are smooth, repetitive patterns. These perfectly uniform vibrations can be produced in a lab, but the kinds of vibrations produced in the skin by touching surfaces in the real world are messy and erratic. Responses of an afferent to different stimuli. For this study, Bensmaia and his team used a vibratory motor that can produce any complex vibration they want. In the first experiment, they recorded afferent responses to a variety of frequencies in rhesus macaques, whose tactile nervous system closely resembles humans. In the second part, a group of human subjects reported how similar or different two particular frequencies felt when a probe attached to the motor touched their skin. 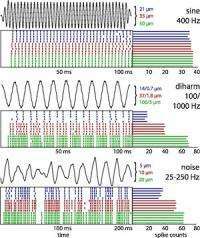 When the team analyzed the data recorded from the rhesus macaques, they found that not only did the nerve oscillate at the frequency of the vibrations, but they could also predict how the human subjects would perceive vibrations based on the neuronal responses to the same frequencies in the macaques. "In this paper, we showed that the timing of spikes evoked by naturalistic vibrations matters, not just for artificial stimuli in the lab," Bensmaia said. "It's actually true for the kinds of stimuli that you would experience in everyday life." What this means is that given a certain texture, we know the frequency of vibrations it will produce in the skin, and subsequently in the nerve. In other words, if you knew the frequency of silk as your finger passes over it, you could reproduce the feeling by stimulating the nerves with that same frequency without ever touching the fabric. But this study is just part of ongoing research for Bensmaia's team on how humans incorporate our sense of touch into more sophisticated concepts like texture, shape, and motion. Researchers could someday use this model of timing and frequency of afferent responses to simulate the sensation of texture for an amputee by "replaying" the vibrations produced in an artificial limb as it explores a textured surface by electrically stimulating the nerve at the corresponding frequencies. It could also be used for haptic rendering, or producing the tactile feel of a virtual object on a touchscreen (think turning your iPad into a device for reading Braille, or controlling robotic surgery). "We're trying to build a theory of what makes things feel the way they feel," Bensmaia said. "This is the beginning of a story that's really going to change the way people think about the somatosensory system." Fascinating, so one big question that arises is "do tactile equivalencies occur at factors of two of a fundamental frequency, as per audition?" In a nutshell - there should be a direct analog of the octave equivalence perception, so if a given frequency conveys the texture of silk, say, then factors of two of that frequency, above and below it, should share key properties of that sensation. Additionally, i predict it will be found that the total discriminable bandwidth of such sensations will itself be octave-bound - most likely falling within a two octave range.